This Hong Kong Super Saver tour showcases the best of the island and includes a stop at the famed Mongkok Market, plus a hop-on hop-off bus day pass. Your comprehensive tour of all the highlights includes a local guide and stops at seven well-known landmarks. Pay a visit to the junk-dwelling community of Aberdeen and check out the stunning beauty of Tin Jau Temple, take a tram ride up Victoria Peak on this all-inclusive experience that’s perfect for first-timers in Hong Kong. Hong Kong Island tour, Mongkok Market tour and hop-on hop-off bus tour – a great value Super Saver! Your Hong Kong Island super saver tour kicks off by following your guide to Repulse Bay en route to Aberdeen. This well-known floating village is sure to be a highlight of the trip, since you’ll have a chance to see junk-dwelling fishermen and their families taking part in daily life. For an additional fee, hop aboard a flat-bottomed boat and tour the harbor right up close. Finally, make your way to Stanley Market, where your guide will lead you to a local jewelry factory where traditional metal smiths craft beautiful pieces using gems and gold. At the last, have a ride on the Victoria Peak tram. This eight-minute funicular railway transports you to one of the island’s best views, where you’ll be able to spot Kowloon and other land masses that dot the waters. 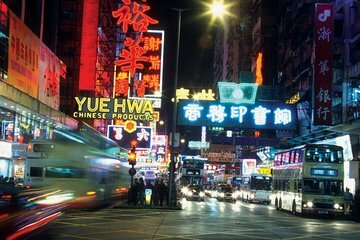 Travel with your guide on a double-decker sightseeing but in Kowloon and experience the energy and excitement of this densely populated district. Your walking tour will take you past commercial streets, unique shops and bustling markets. Make a stop at Tin Hau Temple en route to the markets and learn how this building—the oldest and most traditional temple complex in the area—was erected as an homage to the protector of fishermen. Feel free to explore the city at your leisure once the tour has finished using the hop-on hop-off day pass. This festive double-decker bus makes exploring Kowloon a breeze. Choose from any of the seven stops and take a self-guided tour of the area on foot. Onboard commentary offers deeper insight into culture and traditions as you make your way between Temple Street Market, Tsim Sha Tsui East Promenade and other key destinations. See the Itinerary below for a full list of stops on the blue route. Only had two days in Hong Kong and wanted to make the most of every moment! On the hop-on-Hop-off, we got a great overview of the city to include Kowloon and Hong Kong. We had a different guide each day, both of which were knowledgeable and personable. They filled us with information about the city and also information regarding culture and customs. Our guides were Daniel and Wendy. Wendy took us to the Mongkok markets, what a delight!! The Mongkok Walking Tour was by far our favourite tour of Hong Kong, because of the true insight of daily life of a Hong Kong person. Our Guide Wendy was just terrific walking us through markets where we would normally never go and explaining every aspect of that Market. Also there truly isn't a lot of walking as the Markets are all very close to each other. A totally fascinating experience. We enjoyed Dino and the Mongkok Market Tour and Biddy with the Hong Kong Island Tour. They both spoke very good English and took us on a great tour of Hong Kong. We are unable to use our Hong Kong tour sine the provider scheduled it for the day we returned. Thoroughly enjoyed this walking tour with our guide Stephen. he was very knowldegable and was able to answer all the questions we posed as we wandered through the various markets in the Mongkok area. A real added bonus is the Big Bus hop on - hop off bus ticket which enables you to tour the rest of Kowloon when the walking tour is finished. If you enjoy seeing the the "real" Kowlonn then this is a great way toi start. Great tour.